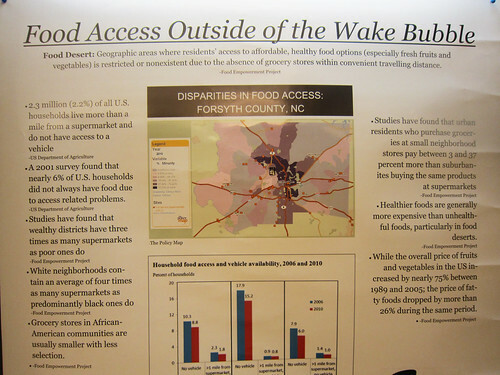 On April 20, 2013, from 9 am – 3 pm, the Hunger Advisory Board, along with other groups, is holding a conference on the issue of food justice in Winston Salem, and the greater North Carolina area. The summit is sponsored by Campus Kitchen, the Office of Sustainability and the Chaplain’s Office. The Food Justice Summit will be held in Carswell Hall, and will have presentations, workshops, and panel discussions. I worked with students in Dr. Hana E. Brown’s class to put exhibits up for this event. Please take some time to read these thoughtful exhibits about issues that affect Winston-Salem and Wake Forest. Great post, Craig! On a related note, I’m excited that Joel Salatin, of Polyface Farms, will be speaking to the freshmen this year! 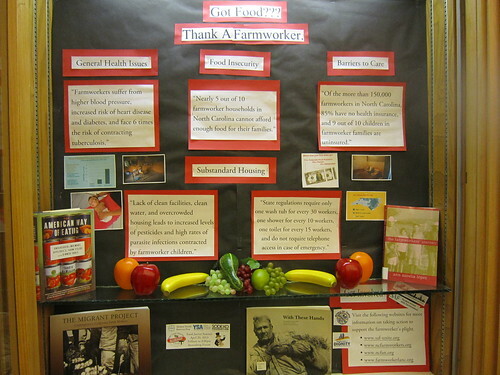 So many excellent project going on around food justice. Great job, Craig. ZSR will also be represented at the Food for Thought Earth Day Fair this Saturday with a booth!